Updated July 24: I have just received an amended set of tracks from AFV Club with the right number of parts and have amended the review below to refleact this. 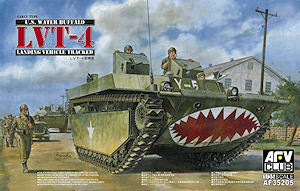 This long awaited set of individual LVT track links from AFV Club is designed for their own LVT-4 kits; AF35205 LVT-4 Water Buffalo (Early type) and AF35198 LVT-4 Water Buffalo (Late type) have finally been released but unfortunately the initial sets did not have enough T4 parts to assembly the two track runs required. AFV Club have now rectified this and included the right number of T4 parts to assembly the two track runs. I have been informed steps are underway to ensure those who bought the initial sets with too few T4 parts will be supplied the additional parts, I have no details on these arrangement at this time and I presume contacting the place of purchase would be the best start. 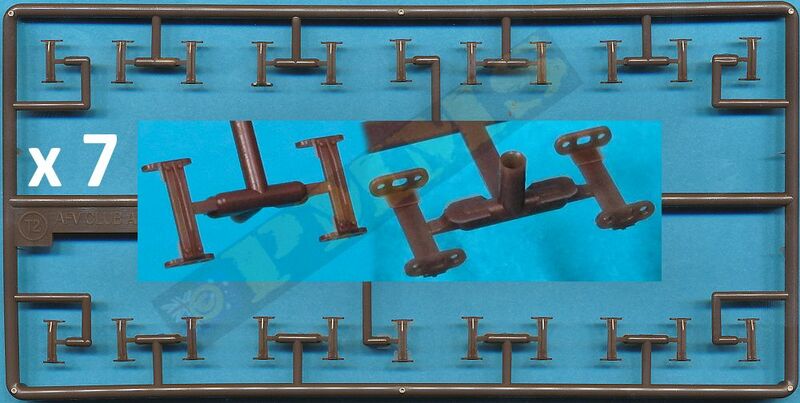 Each track run is made up of 72 large links with the rounded M sea paddles (parts T1), 72 of the smaller joining links (parts T2) 144 of the link pins (parts T4) as 2 are required for each of the smaller T2 links and 72 securing brackets (parts T3). 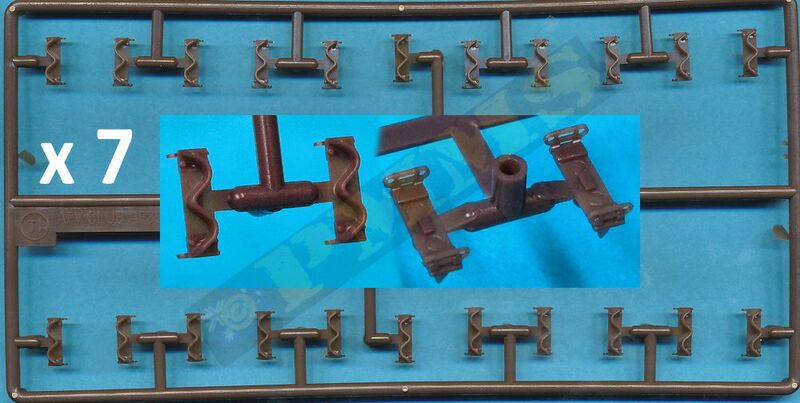 The set includes 7 x T1, T2 and T3 sprues with 22 links parts per sprue for a total of 154 links parts with each track run requiring 72 link parts each (144 parts for both track runs) with 10 spares. Now included are 6 x T4 sprues with 48 parts per sprue for a total of 288 pin parts, just enough for the 144 per track run but leaving no spares so make sure you don't lose any during assembly. The track links are moulded in a dark brown plastic with clean crisp details with just the occasional fine flash mostly on the smaller connecting links (parts T2) but this is present on only a few of the links with the majority just requiring the single sprue attachment bur cleaned up prior to assembly. Due the number of individual parts for the tracks this clean-up does take a bit of time as anyone who has assembled individual links will know well. Dimensionally the actual LVT track links are 14.25inch or 36.2cm wide which equals 10.3mm in 1:35 scale with these links measuring 10.3mm wide give or take a fraction to be spot on in width. The actual vehicle uses 73 links per track run with this set using 72 links per track run for just a very small variation in pitch. The box includes an assembly guide on the back and given the number of parts assembly is is a little tricky especially to begin with as you basically have to fit four of the links (two T1 and two T2) along with four of the link pins (parts T4) all without glue before you can glue the first securing bracket (part T3) to hold the links together and trying to hold all these links together without them coming apart is quite tricky. An assembly jig similar to that in the Friulmodel LVT track set would make things easier. To make things a little easier I initially glued one of the link pins (part T4) to one end of the smaller links (part T2) as this at least made one less part to come adrift during assembly. 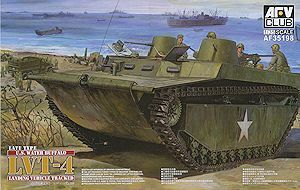 (Image 1). Assembly then starts by fitting the small link (T2) with pin (T4) attached into one of the larger links (T1), (Image 2) you must take care to have the sea paddles all pointing the same direction as you fit each link because you can't see these as you assemble the links and it's easy to fit the link with the paddles the wrong way around if not careful. You then slip the next large link (T1) over the pins slightly flexing the unglued pin inward as you fit the link end (Image 3). The next small link (T2) and end pin (T4) are slipped into place (Image 4), you can then clip the retaining bracket (T3) over the first join (Image 5). The bracket clips into place over the ends of the end pins and you only need a very small amount of glue on the sqaure locating lug to hold the braqcket in place. Now the first links have been joined you simply repeat the process of slipping the large link (T1) over the end pins, add the next small link (T2), the end pin (T4) and then the retaining bracket (T3). A couple of things to watch, first is the direction of the M paddles as mentioned, the second is some of the pin holes on the end s of the larger links (T1) had some very fine flash that prevented the pins going through the holes easily and using a 0.65mm to check the holes are all open will prevent any problems, this was only an issue on a small number of links at the end of the day. The assembled track run has excellent detail on the side connectors and link faces as well as articulating easily providing you were sparing with the glue when attaching the retaining brackets. One thing to note is the locating lug for the retaining bracket is eveident on the insdie of the links but this is all but invisible whe the tracks are fitted to the kit and so not of any real concern. 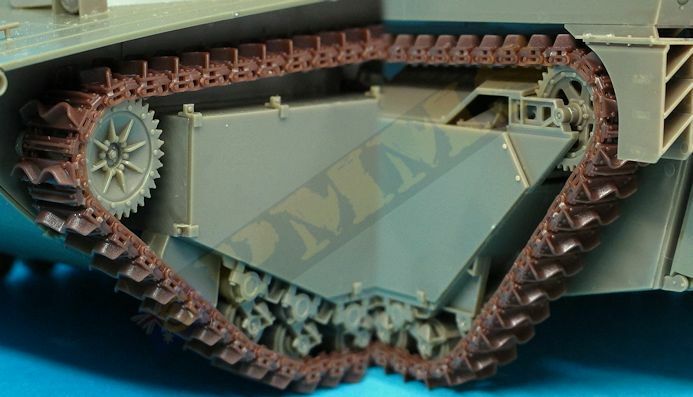 The fit to the AFV Club LVT running gear is very snug with 72 links (144 in total of the two styles) with a very good fit around the drive and idler sprockets as you would expectto give a very good appearance on the model with the detail more refined than with the kit vinyl tracks. I also tested the fit to the Italeri LVT suspension but unfortunately the teeth on the drive and idler sprockets were too big to intermesh with the AFV Club track and therefore I didn't persue it further. It would be possible to modify the kit sprockets by cutting off the teeth directly under the tracks so they sit flush around the sprockets to use the tracks with the Italeri kits. Track links fitted to AFV Club LVT kit suspension. 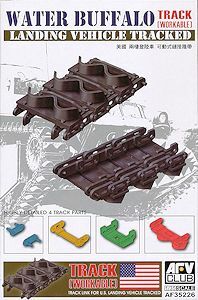 This is an excellent set of workable LVT track links from AFV Club with very good track link detail and after the clean-up of the large number of track link parts assembled fairly easily if a little fiddle to get the track runs started. The fit to the AFV Club LTV kit suspension was also very snug around the sprockets and road wheels for a good appearance. 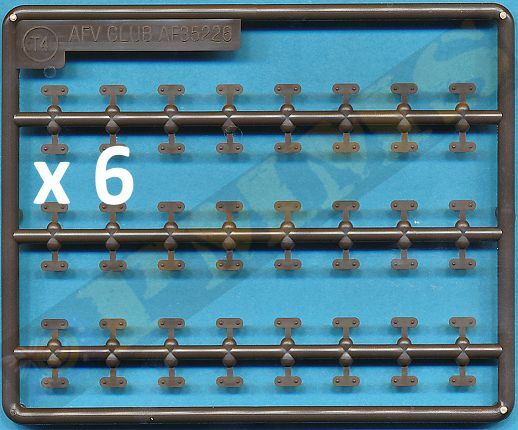 As updated above AFV Club have now added the right number of parts required to the sets making these as excellent choice to update the kit tracks for added details. Kudos to AFV Club for rectifying this situation quickly after being advised. Thanks to my credit card and for the review sets.